Convenience and speed are the main reasons for mobile shopping. Significant number of heavy mobile shoppers in Europe: 39% of Europeans use their smartphones for purchases at least once a week. Shopping with a smartphone accounts for a quarter of the total shopping volume. Three out of four Europeans (72%) plan to shop Christmas gifts via mobile devices, 82% of them make Christmas shopping on the couch. 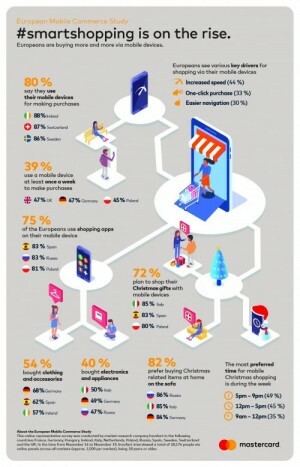 Waterloo, Belgium, 29.11.2018 – In Europe, smartphones are now established shopping devices and as normal as physical shopping; 80% of the European citizens use their mobile devices for making purchases, 41% of them do so often or even always. This is the result of a representative pan-European survey with over 18,000 participants. The study has been commissioned by Mastercard and was conducted by market research company Innofact. Four out of ten Europeans make mobile purchases at least once a week. There is a significant number of heavy mobile shoppers in Europe: For example, in UK and Germany nearly half of the people shop once a week or even more often (both 47%), across Europe it is 39%. In total, mobile shopping already accounts for a quarter (24%) of the total shopping volume, according to the 18,000 European participants. Nearly three quarters (72%) of the Europeans plan to make use of their smartphones for Christmas shopping. The majority likes to buy gifts at home on the sofa (82 %) or in bed (25 %). But people also benefit of the speed and easiness of mobile shopping and use their waiting time or breaks for quick Christmas shopping: A significant number of Christmas goods is bought while being in or waiting for public transport (19 %), at work (18 %) or during a break or lunch (9 %). When the participants were asked to choose their top three mobile Christmas shopping times, most Europeans voted for slots during the week, not on the weekends. The most popular time (49 %) is in the evening of the weekdays (5-9 p.m.). However, a large number of Christmas gifts is also bought on weekdays from 12-5 p.m. (42 %) and 9-12 a.m. (31%). Speed and convenience are the key drivers for mobile shopping. Europeans see various reasons why they like shopping with their smartphones: The leading are increased speed (44%), one-click purchases (33%), easier navigation (30%) and enhanced security (14%). Especially the people in UK (22%), Ireland (21%), Spain and France (20%) see enhanced safety as an important key driver to buy mobile whereas Polish (63%), Germans (59%) and Swiss (56%) seem to be the most efficient smart shoppers as they favour speed over other criteria. Clothing and accessories are the most popular items for mobile commerce. More than half of the Europeans (54%) already bought clothing and accessories via mobile devices, in Germany even 68%. Electronics and appliances follow as the second biggest item with 40 %. On some items – like tickets for public transport – there are big difference between the markets: Nearly half of the Swiss population buys them mobile (48%), but only 17% of the Russians. When it comes to park tickets, 44% of the Swedes are mobile shoppers, in Germany only 12%. The majority of Europeans uses more than one shopping app. Given the volume and variety of mobile shopping it should not surprise that 75 % of the Europeans used shopping apps for their mobile commerce in the past 12 months. The majority of them (64%) uses two to five, 20% of them even six or more. This online-representative survey was conducted by market research company Innofact in the following countries: France, Germany, Hungary, Ireland, Italy, Netherlands, Poland, Russia, Spain, Sweden, Switzerland and the UK. In the time from November 14 to November 19, Innofact interviewed a total of 18,174 people via online panels across all markets (approx. 1,500 per market), being 18 years or older.